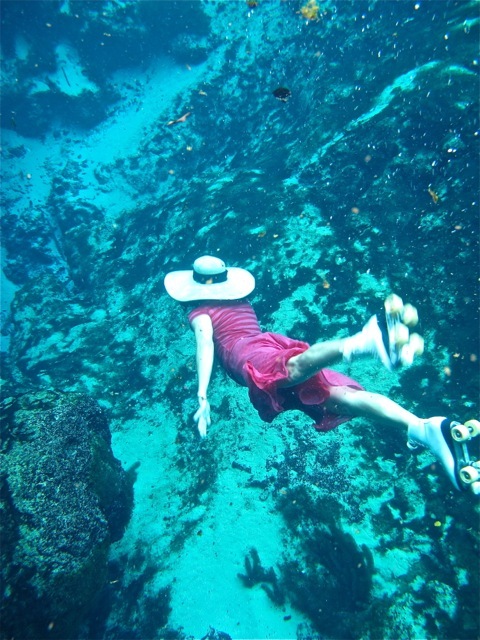 As she approached 60 years old, Eleanor K. Sommer decided to dump her nine-to-five job and embark on an adventure. Rather than retire, she chose to attend graduate school and turn her 40 years of writing, editing, and publishing experience into an environmental journalism career. Her first effort on this path has been to enroll in the School of Natural Resources and the Environment at the University of Florida. Having previously eschewed the snow-covered hills of northwest New Jersey, Ms. Sommer had fled to the Florida sunshine to attend the University of South Florida in 1970. 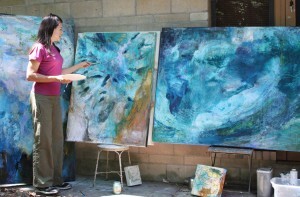 Subsequently, worked as a reporter and editor, and eventually published a monthly business magazine. She moved to Gainesville in 1994 and settled on 10 acres of “real” Florida near Paynes Prairie with her husband and 100-pound yellow Lab. Erika Ritter leading a trip on the Ocklawaha River. 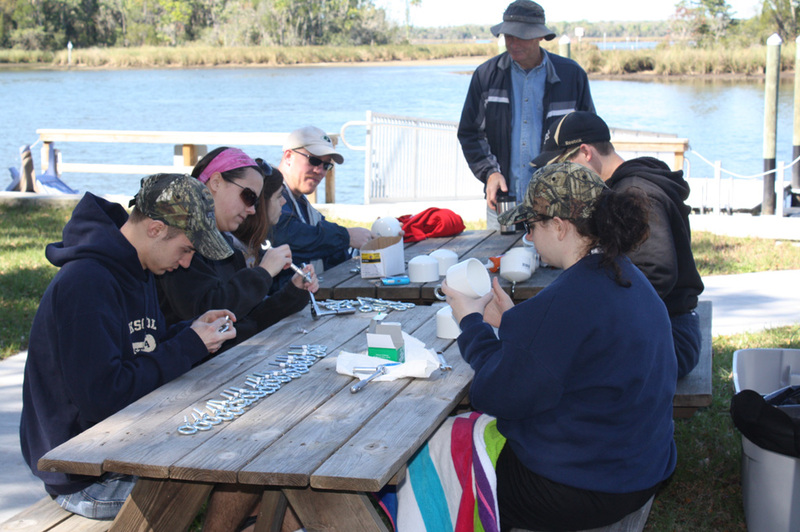 For a couple of months every three or four years, an excursion on the Ocklawaha River is a unique journey. The examples of evaluation essays water is closer to historic levels of the waterway prior to the construction of a dam. That’s when inland waterway captain Erika Ritter most enjoys taking passengers down the river. The Rodman Reservoir near Palatka, Fla., was drawn down in December 2011 to remove invasive plants that clog the lake created by a dam. 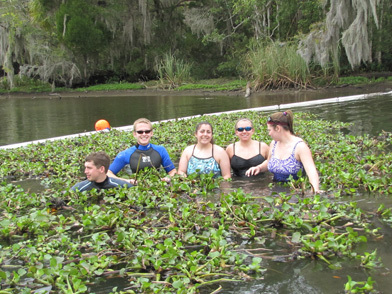 For a few months the Ocklawaha is about 11 feet above sea level—low enough to see the ecosystems, wildlife and shorelines that are usually buried beneath 20 feet of water. At 11 feet, thought, the river is still five or six feet about its historical level on its journey for the confluence of the Silver River to the St.
Johns River and finally to the ocean. Ritter has lived on the Ocklawaha almost all her life. 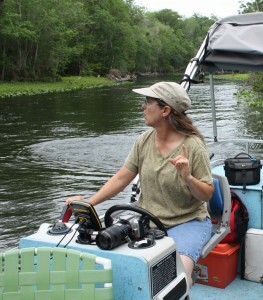 A fourth-generation Floridian, she started river tours on the Silver River in 1983. In 2006, she decided to return her business to her backyard: the Ocklawaha. She can fit about eight people on her pontoon boat, which has chairs with containers beneath for guests to keep their belongings dry. Ritter has maps and plenty of tales about the river’s history, including one about the failed Cross-Florida Barge Canal, a project so unfathomable and complex that an entire book, Ditch of Dreams, was written about the event that spanned more than 40 years and cost $75 million. Ritter begins the tour telling passengers how to pronounce the river’s name. There’s no “a” after the “o;” so it’s not “oak-lawaha.” The sound is more like the “oc” in octave, she explains. Her family lived on the river when the canal was constructed, relics of which include the Buckman Lock, the Rodman Reservoir, and a few very high bridges in the middle of nowhere. She offers visitors her view of the continuing battle between some bass-fishing enthusiasts, the Florida legislature and environmentalists over the status of the Rodman Reservoir dam that keeps the Ocklawaha from its natural flow. Most of Ritter’s narrative, though, is about the river and its natural history. 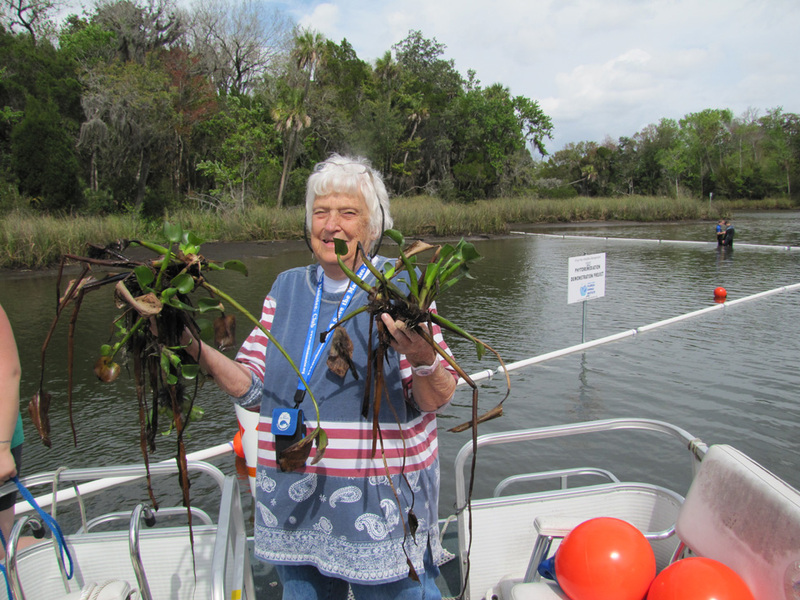 She tells passengers about the manatees, the catfish and the natural ecosystems. She points out a small bird, stark yellow perched on a drab grey fallen tree. “That’s a prothonotary warbler,” she says slowing down the boat, so passengers can get a better view. 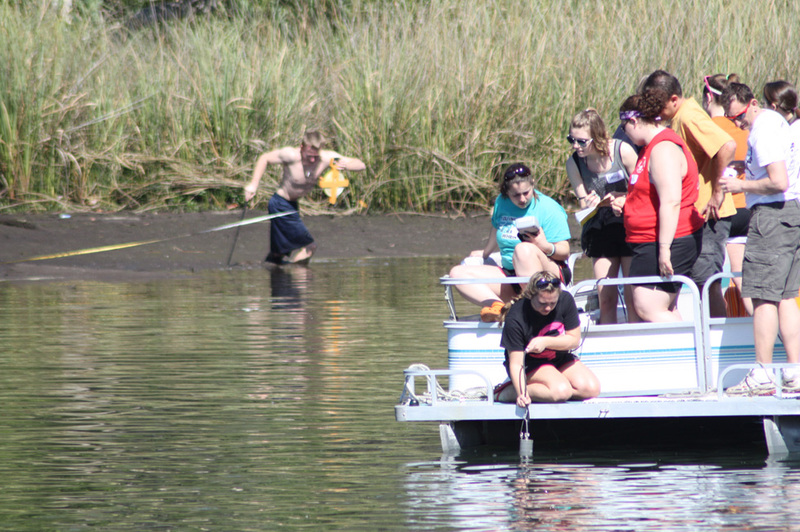 Soon she stops the boat completely to get a better view of a huge lone catfish. Channel catfish and 16 other species of fish have been excluded from the river because of the dam and the Buckman Lock. The lock was designed to lift boats from the level of the St. Johns River to the level of the Rodman Reservoir. As the pontoon boat putters past old pilings of a steamboat landing, Ritter points to her old family homestead. 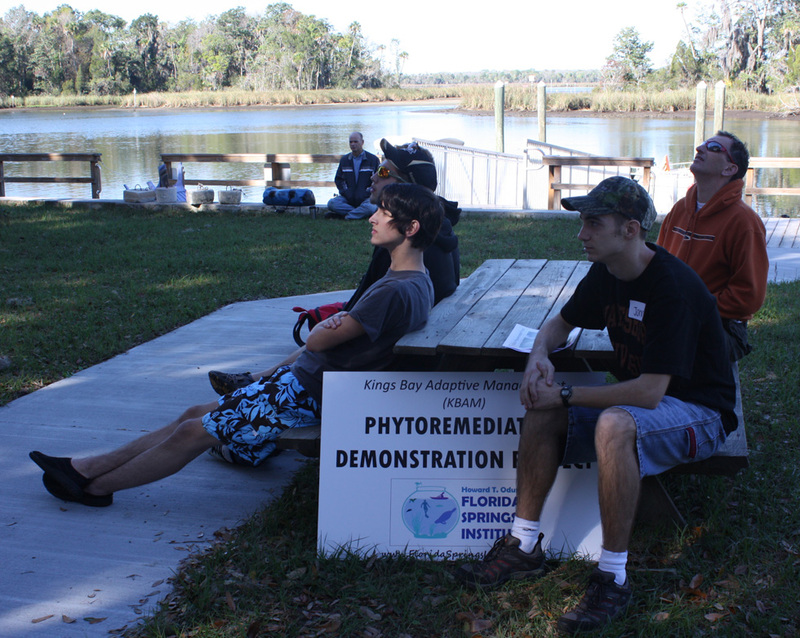 “This used to be a nice peaceful area, but now it is full of exotic plants and airboats,” Ritter says. Paul Nosca, also known as “Ocklawahaman,” joins in the narrative. “And there used to be fish camps all up and down the river,” he says. Not long into the excursion, an airboat speeds by from around a bend. The driver looks frustrated as he tries to get around the slow moving craft piloted by Ritter. Rather than slowing, he revs his engine and glides past, forcing frothy wake toward the pontoon boat and against the fragile ecology at the river’s edge. Ritter points out more sites as the boat moves slowly down the river. “That’s where the crusher-crawler came through,” she says. “My mother knew it was coming,” Ritter says. “She sat out on the dock and cried,” Ritter says. She was about 10-years-old when she overheard adults talk about the impact of the dam and the canal. She recalls her own fears, especially that her favorite places to play would be usurped by the barge canal. She was afraid her world would be crushed too, she recalls. “I used to walk down to this beautiful creek. There were all the things that you could get to as a child—right at the edge of the water. Like the grass and shallows. You could play with the little minnows and stuff,” she says. 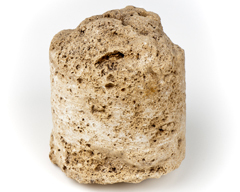 Once the canals were dug and the trees and vegetation gone, invasive plants took hold, and contractors and government agencies came to remove them with chemicals. One day, she remembers, her mother was directly sprayed. “Most people did not want the barge canal. But the politicians thought it would increase the economy. Big boats could cross Florida using the locks,” Ritter recalls. The lifelong efforts of Marjorie Harris Carr and others finally convinced politicians that there was more money in fishing and tourism,” Ritter tells the passengers as her boat floats past degraded woodlands. 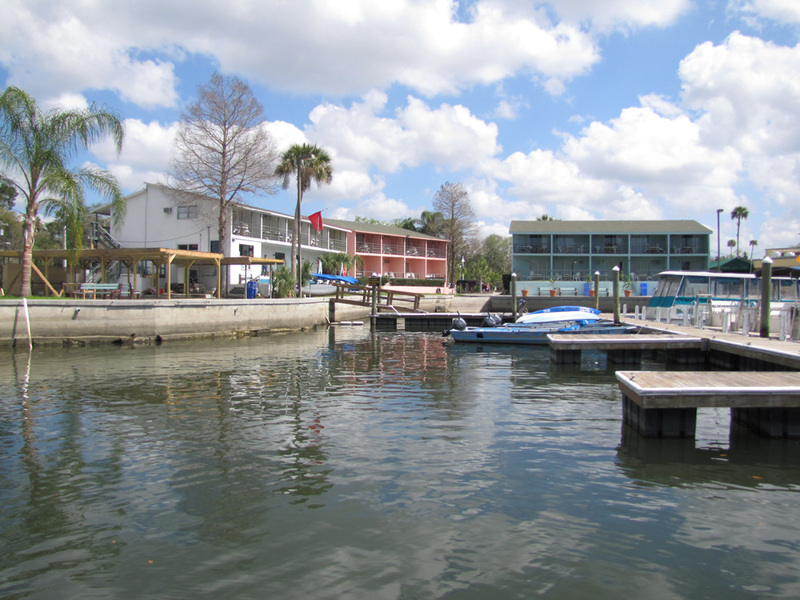 The Cross-Florida Barge Canal was officially suspended in January 1971 by executive order of President Richard Nixon. The river banks stay flooded with water for years at a time and the river current slows. The natural Ocklawaha had a rapid flow. Water from Silver River, near Ocala, could reach the St. Johns River in three days. The rapid flow kept the sandy bottom clean, Ritter says. When the dam is closed the water travels significantly slower, taking up to 23 days to reach the St. Johns. Without the strong flow, algae get out of control. As the boat glides near a shoreline, Nosca points to the banks. “They used to be white sand with easy access to the river, once you were out of the woods,” he says. The banks he points, though, are thick groves of declining cypress trees and stumps, sagging oaks, and tangled possum haw–nearly impenetrable. Muck and detritus cover the shoreline. “This is one of the oldest rivers in Florida,” Nosca tells passengers, recounting its geologic history through the central ridge—the area of Florida’s highlands that have persevered over millions of years of sea level rise and decline on the Florida peninsula. 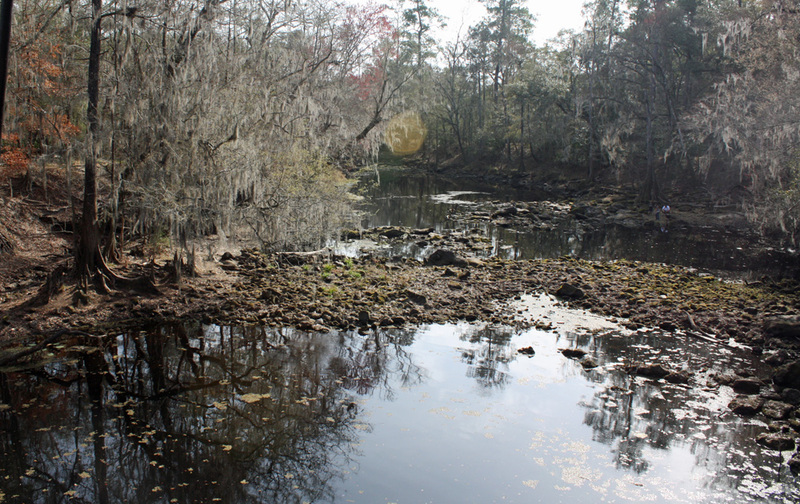 “The Ocklawaha might be 17,000 years old,” he says. Ritter maneuvers the boat gently against a bank and Nosca helps passengers disembark for a short excursion into woods that are usually under water. A few mosquitoes buzz around as passengers carefully make their way through branches and knotted roots, until they come to what appears to be a wood wall. Nosca waits for the awe to sink in. It’s a cypress tree as large as a cabin and stretching what seems to stretch 100 feet into the air. The tree is completely hollow. Standing inside the cavern of its wide base, it is possible to see the sky. Shafts of light pour through several slashes in the trunk. A bit of wispy green fringe struggles from the top against the sunlit blue background. As the group makes its way back to the boat, Nosca points out the trees progeny. Tiny cypress barely inches high sneak up from the leaf and humus on the ground. “They’ll be drowned in a few weeks,” he says, a noticeable sadness in his voice. Although cypress trees grow well in swamps and wetlands, the four-year period of high water when the Rodman Dam is closed is too much for their normal life cycles. The trees typically reproduce from seeds more readily than from suckers. The seedlings have no chance for survival. They die soon after the water rises over the banks. The suckers are just as threatened; they cluster tightly at the base of the mother tree, as if clinging to hopes of surviving another flood. When the reservoir is full, the cypress also struggle for oxygen in the depleted and nearly stagnant high water. The trees frantically send up knees, desperate for a breath. Cypress knees are typically spaced a foot or more from each other, but in the Ocklawaha they are glued together in grotesque malformations, resembling abstract rather than nature. Tree after tree along both banks of the river look identical—high water mark noted by a ghostly shadow of mineral scale. Overhead are sparse patches of pale green needles fluttering in a breeze. Absent is the thick lush spring growth that healthy cypress would sprout this time of year, Ritter says. “Because of the constant water, we’re losing the diversity of trees, too,” Nosca says scanning the bank and pointing to a few flowering haws. When flooded, the river-channel ecosystem loses 14,000 acres of land that was used by ground-nesting birds and other wildlife along the banks. The situation is controversial. 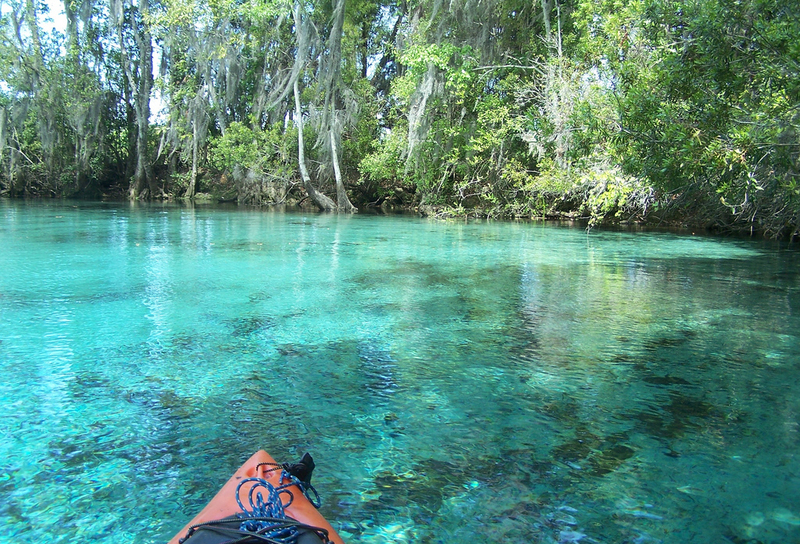 Some government agencies have recommended restoring the Ocklawaha River to its natural state and establishing it as an official “Wild and Scenic River,” according to Florida Defenders of the Environment. Others believe the fishing in Rodman Reservoir and the economic benefits are more important. Ritter says she wants to see the river the way she remembers it from childhood. In the meantime, she hopes that people will have an appreciation of the river and see that it is a special place—a sanctuary to learn about nature. “And when they go back to town, they will realize that there is a place they can come back to. 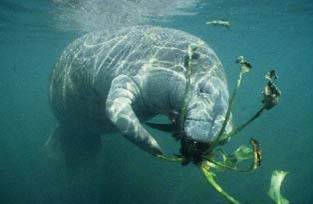 A quiet place where humans have not totally taken over and changed the habitat and run off the wildlife,” Ritter says as she slides the boat back to the dock marking the end of the idyllic journey down the Ocklawaha. 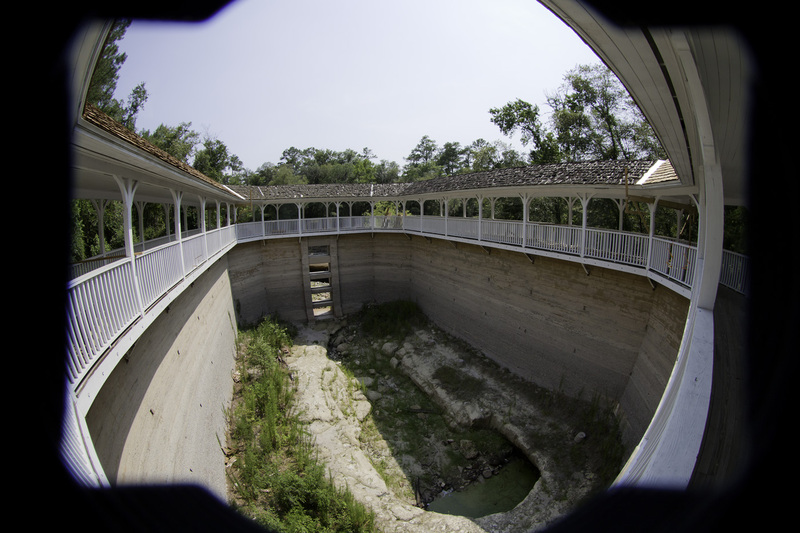 A request by Adena Springs Ranch, near Fort McCoy, Fla., to withdraw 13.2 million gallons a day from the Floridan Aquifer is being challenged by hundreds of people in north central Florida. Owners of the 30,000-acre cattle ranch have applied to the St. Johns River Water Management District to pump more water daily than the 12 million gallons that the city of Ocala withdraws for public use. The application is currently in the hands of the water management district for review. Supporters of the project say that it will create local jobs and provide a clean industry for Marion County. Adena Springs Ranch wants the volume of water to irrigate land to raise grass-fed cattle. 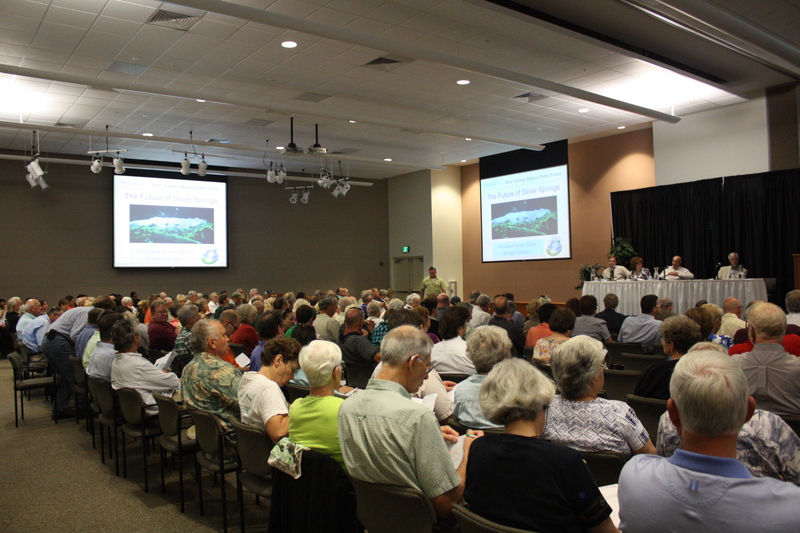 Audience at the April 3 public forum at the Ewers Century Center Klein Conference Room at College of Central Florida on water consumption and the Adena Springs Ranch permit. Those against the project, as well as those who would like to see the consumptive use permit limit decreased, packed an auditorium at College of Central Florida in Ocala in early April to learn more about the impact of a planned beef operation that includes a slaughterhouse and packing plant. 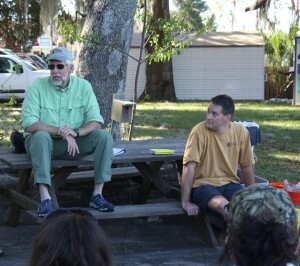 The meeting was organized by the Silver River Alliance, which formed in January 2012 to protect the heritage river and its first magnitude springs. Alliance members and area residents are concerned about the effect Adena Springs Ranch will have on water quality and quantity in the Silver River watershed, which stretches from Leesburg to Melrose and encompasses parts of Ocala National Forest and the Ocklawaha and Silver rivers. ?When I first heard about the grass-fed cattle proposal,? said Diana Kanoy, who owns an adjacent 50 acres. ?It seemed an acceptable alternative if the land were not to be kept as a tree farm, or ideally, allowed to revert to its natural state as a water absorption and regeneration area and corridor for wildlife.? Kanoy became alarmed, she said, when she discovered the extent of the operation and the amount of water it could consume from the Floridan aquifer. 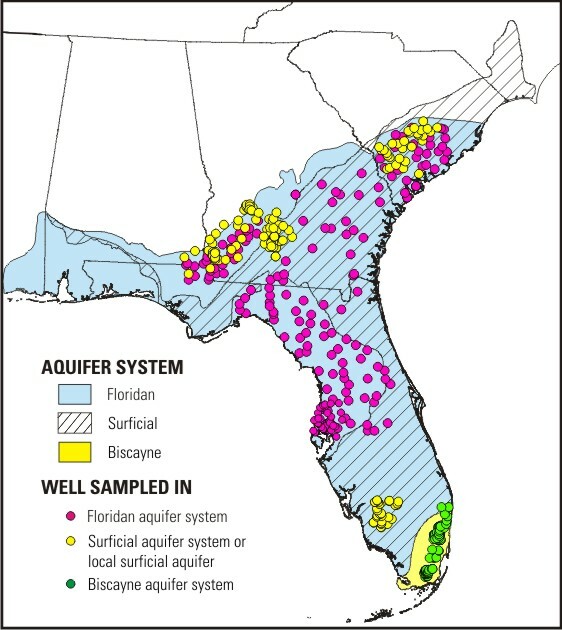 The aquifer is a natural underground reservoir that stretches from Florida to South Carolina that supplies nearly 90 percent of Floridians with fresh drinking water. ?This request for vast water consumption forebodes the ominous possibility of our wells drying up, the lakes receding, and even the trees dying, turning our homes and small farms into wastelands, and destroying our work and dreams of pleasant and productive country life,? she said. Stress to Florida?s water supply has become a concern across the state. The Adena Springs Ranch permit request poses another impact on the already stressed aquifer system, panelist Bob Knight said. 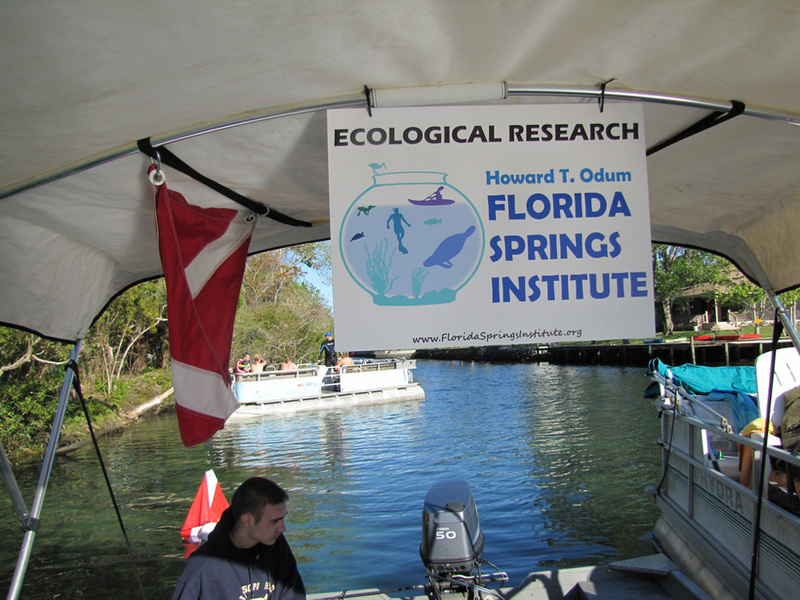 Knight, director of the Howard T. Odum Florida Springs Institute, said he is not opposed ?conceptually? to the cattle ranch, but that the water use request is excessive. The quantity of the water requested ?represents the most efficient use of water possible for the requested,? attorney Edward de la Parte said in an email response to questions about the project. Some believe the meat production facility, owned by Canadian billionaire Frank Stronach, is being built to take advantage of the lucrative market for grass-fed beef as more and people look for healthy and humane sources of food. Kanoy said some local residents see the ranch as a better alternative to other types of industry that might locate to Florida. Previous proposed use of the property, she said, included ?a paramilitary training camp? that the Marion County Zoning Commission rejected in 2008. In the midst of the current economic slowdown, Adena officials have pointed to jobs as a benefit of the facility, according to speakers at the meeting. Adena officials have estimated, in addition to the construction jobs, the facility will employee about 100 people. In permit requests filed with Marion County, Adena Ranch estimated its capital investment to be around $39 million. Roy L. ?Robin? Lewis, panelist at the public forum about water consumption and the Adena Springs Ranch. The operation has already received approval for slaughterhouse and meat processing facilities on one parcel where tree clearing and construction has begun. These activities were challenged in a letter to state officials from St. Petersburg attorney John Thomas on behalf of wetland expert Roy L. ?Robin? Lewis. Lewis?s four-page letter is supplemented by 31 pages of maps, tables, and charts that provide scientific and engineering data about why the Adena Springs Ranch will detrimental to Florida?s ecosystem, threatening springs and rivers as well as ground water quantity and quality. Stronach appears to have a voracious appetite for land, according to a story from the Canadian news publisher Macleans. He owns more than 70,000 acres around Ocala. With the huge commercial interest in water sales world-wide, a number of people at the meeting asked if the permit could be used for other purposes. If Adena wants to use the permit for something else, they will need to reapply, according to Mike Register, director for St. Johns River Water Management District Division Regulation Services. The permit would be valid for 20 years and with a 10-year compliance review, he added. The management district will likely approve the consumptive use permit, especially in the current political climate, Karen Ahlers said. Ahlers, a Putnam county resident, has retained the Southern Legal Counsel to monitor the permitting process and prepare for a lawsuit if necessary. Karen Ahlers, environmental activist; Debby Johnson, paralegal with Southern Legal Counsel; and Buddy McKay, former lieutenant governor and board member Southern Legal Counsel. ?I believe that we need the credible threat of a lawsuit,? which she said ?will encourage the district to do double duty to get it right.? 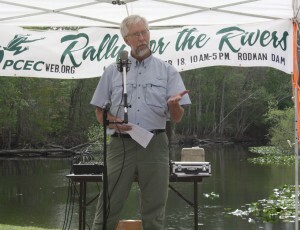 Ahlers is a long-time activist for natural resources in Florida and has fought to restore the Ocklawaha River. 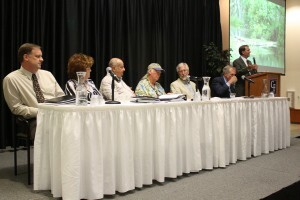 Adena Springs Ranch officials were invited to participate in the two-hour presentations and panel discussions, but declined according to moderator and president of the Silver Springs Alliance, Andy Kesselring. Present at the evening meeting were some members of the Marion County commission, as well as former Florida lieutenant governor Buddy McKay, a board member of the Southern Legal Counsel and a supporter of environmental issues in Florida. ?I am passionate about preserving Florida?s water,? said McKay, best remembered for his work to prevent stop the Cross Florida Barge with Marjorie Harris Carr. Lewis handed over a personal check for $5,000 to Neil Chonin of the Southern Legal Counsel to begin the support for legal action. Ahlers said about $250,000 are needed to monitor the approval process, gather scientific evidence of the negative impacts to water quality and quantity and to prepare a legal case should the permit be approved. ?The threat of a lawsuit and close scrutiny of the application process may be the only way to protect the interests of the public,? Ahlers said. ?We?re in this for the long haul. We will go forward until we have exhausted every legal remedy.? The challenge is not just drinking water, she said, but entire ecosystems. ?This is not just a Marion County issue. It is a statewide issue. A test of whether or not citizens of Florida are going to throw up their hands and allow corporate and political interests to destroy what is left of Florida?s natural resources,? Ahlers said. Second group of panelists for the public forum about water consumption and the Adena Springs Ranch. From left to right: Mike Registers, St. Johns River Water Management District; Barbara Fitos, executive director Community Foundation for Ocala Marion County; Neil Chonin, environmental lawyer with Southern Justice Association; Roy L. ?Robin? Lewis, professional wetland scientist; Bob Knight, director of the Howard T. Odum Florida Springs Institute; Guy Marwick, executive director of the Felburn Foundation, and Andy Kesselring, president of the Silver Springs Alliance. 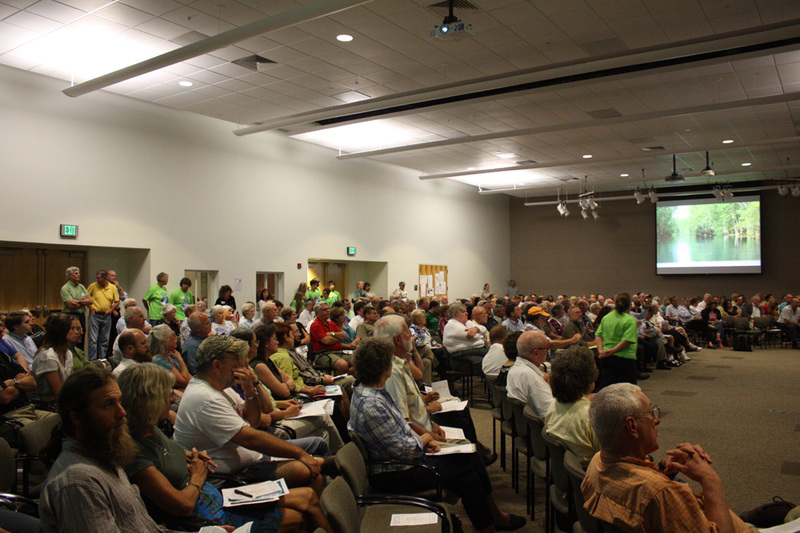 Participants at the meeting asked if irrigation water would filter back to the aquifer. ?That?s not the way it works,? Knight said. Typical overhead irrigation systems lose about? 70 percent of the water to evaporation. Another 10 percent will probably runoff, he said, moving toward the Ocklawaha River, he said giving at rough estimate at that about 20 percent of the water applied would actually recharge the aquifer. 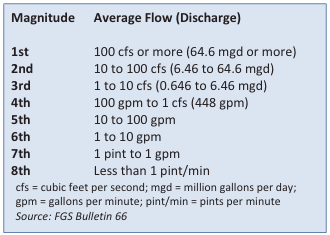 ?But what do think a million pounds of cow manure a day will do to the aquifer?? Guy Marwick, panelist and executive director of the Felburn Foundation and founder of the Silver River Museum, said. Florida?s fresh water supply is already threatened by high levels of nitrates from commercial and natural fertilizer, which contaminate springs and possibly the aquifer, according to Knight. Scotty Peterson, a student from Vanguard High School and one of the two student board members of the Silver Springs Alliance, did not think too much of the employment promises by Adena Springs Ranch. 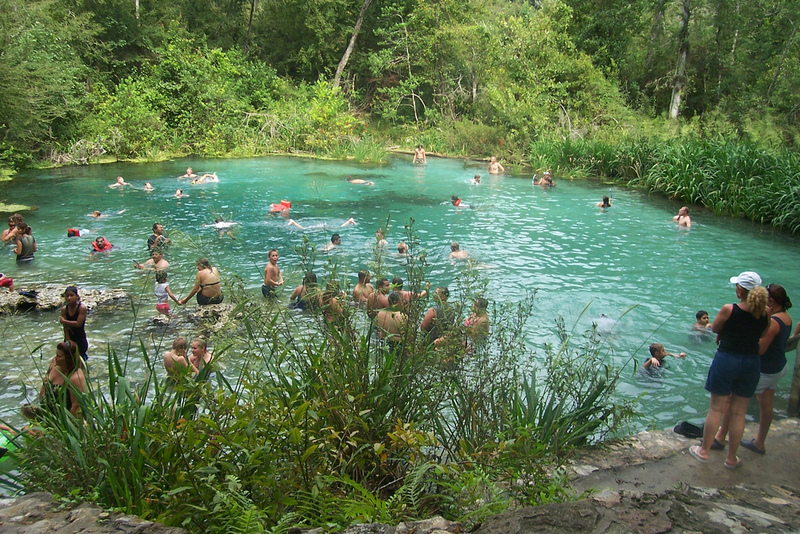 Silver Springs alone generates an estimated $60 million a year in tourism and recreation, Kesselring told the audience. ?Consider risking $60 million for 100 jobs?? he said. ?I don?t think so.? 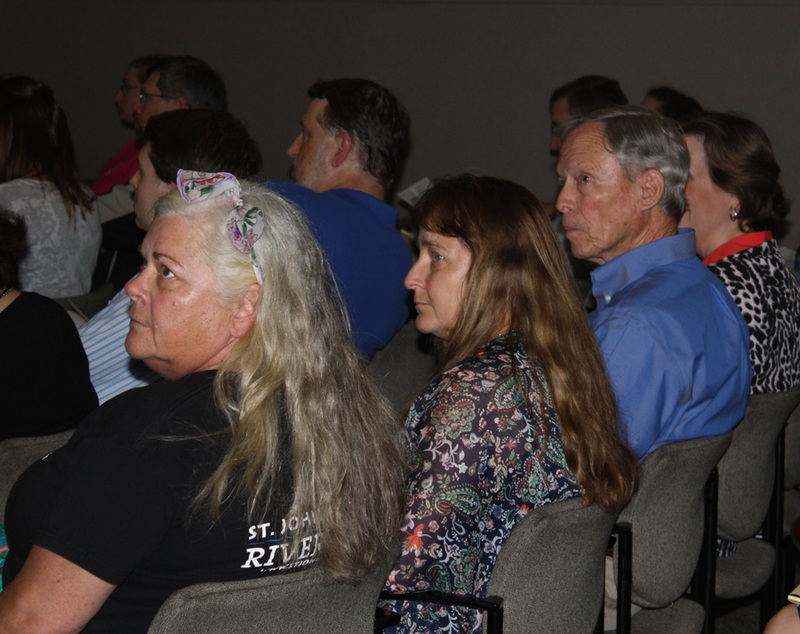 Of the 700 comments received by the St. Johns River Water Management District, most have been opposed to the project or requested more information, according to Mike Register, director for Division Regulation Services. De le Parte, however, does not believe the comments represent a sampling of Marion County citizens. Marion County has [331,000] residents, and of the comments received only about 200 from those in the county. The other comments, however, are from people who live within the watershed affected by the projects, as well as from those concerned about drawdown of the Florida aquifer. ?Like many projects of this type, it is much easier for persons to oppose to organize and express concern,? De le Parte said. ?The applicant is convinced there are many more citizens in support of the projects.? A review of the district permitting application for the project turned up very few supportive comments. Marion County commission candidate Butch Verrando, said in an interview that he commended the project for its compatibility with the local environment, its commitment to raising grass-fed beef, and the jobs it will provide for Marion County residents. ?There?s a segment of the population here that wants to push ?ecotourism.? But that does not bring enough dollars to the area,? he said. ?Off-road bikes and kayaks will not pay the bills.? Marion County has a labor surplus and Fort McCoy especially is in need of employment opportunities, he said. Verrando said scientists who are speaking out against the project are ignoring the cycles of rainfall that are a part of Florida?s natural history, he said. Presenters at the meeting pointed to the ongoing drought in Florida as one of the reasons to deny the permit. De la Parte disagrees. 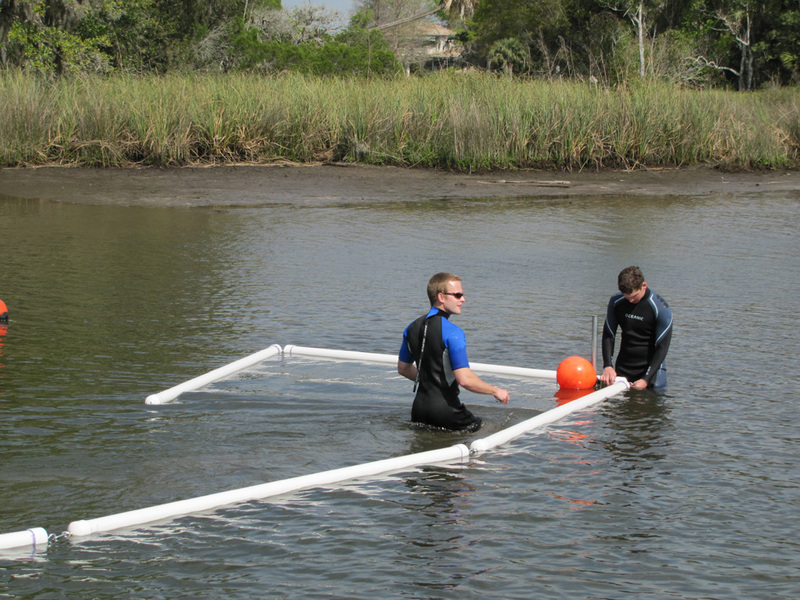 ?Variability in rainfall has been the hallmark of Florida?s climate for the past century,? he said. While climate change and sea level rise are a matter of consensus, he said, ?some scientists have predicted an increase in the number and intensity of tropical storms, which would tend to increase rainfall in Florida.? Lawren Moody, a third-generation Ocala resident, supports the project and does not see the water permit as an issue. It ?may sound like a lot, but compared to what industry and agriculture use, it?s not? he said. 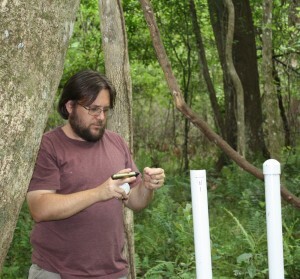 Verrando determined the water withdrawal amounts to 441 gallons per acre. Mike Register, who spoke on behalf of the water management district said the agency will follow the rules for examining the permit and for reaching a decision on whether or not to grant it. The district is required to give first priority to human consumption of water and second priority to agriculture for human consumption, and so he believes the district has no choice but to grant the permit. Citizens, including Karen Ahlers, who has pledged to fight the permit, said they are willing to protest the permit at every legal opportunity. Register outlined the procedures in detail, including the criteria for denial, the appeal process, and the scientific investigation that will be done to determine if the project will impact water quantity or quality. Ahlers said an appeal of the process must be done within 21 days of determination of the permit request. That?s why, she said, it is important to be prepared. 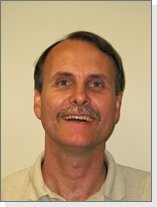 For a systems librarian, a kind of person one might typically consider practical and studious, Paul Clark has a decided “spring” in his step. 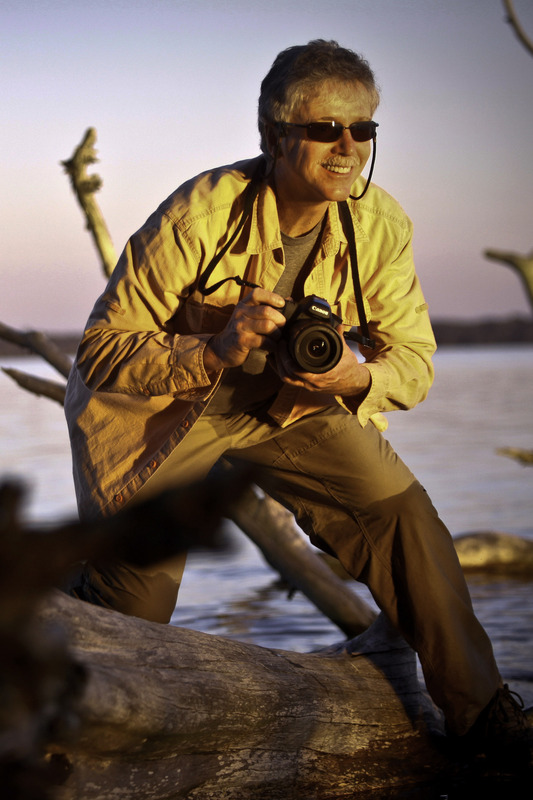 The award-winning librarian for Clay County Public Library has a passion for Florida springs as evidenced by the 1200 photos on his Flickr page. 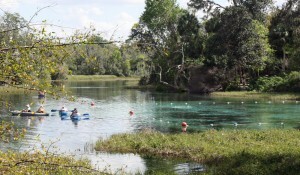 His blog, Florida Springs lists six years of news posts about, and often photos of, springs in the state. When he is not fully engaged in literacy or reading campaigns, improvements to the library system, or lobbying state government for library funding, Clark travels the state visiting and evaluating springs. 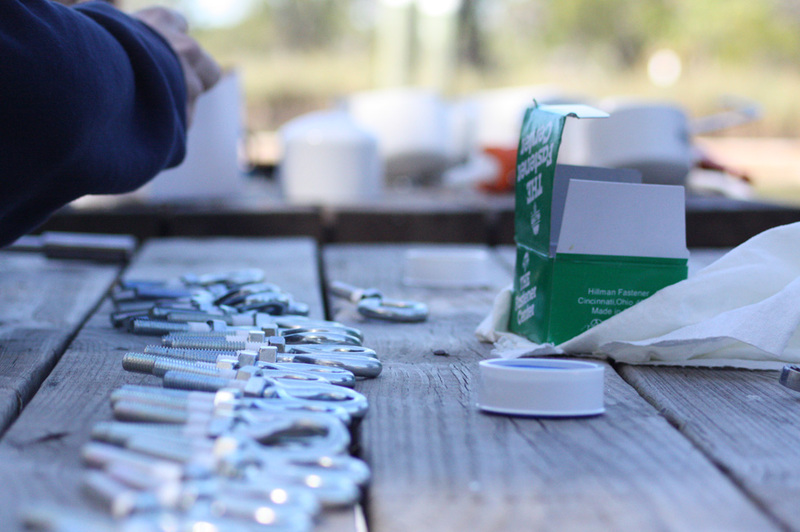 From current events, cleanups and restorations to ecological data, government actions, and grassroots conservation efforts, Clark is a reference of springs FAQs. Clark’s site has had 165,000 unique visits and racks up about 1000 hits a week. He lost the original URL. He was so busy with other projects including his state-wide library campaigns as well as work on a children’s book—that he failed to renew the domain name and someone else nabbed it. However, he recently reloaded material to a nearly identical URL. None of his documentation was lost and is available for anyone browsing for a stunning weekend in Florida’s crystal clear springs. 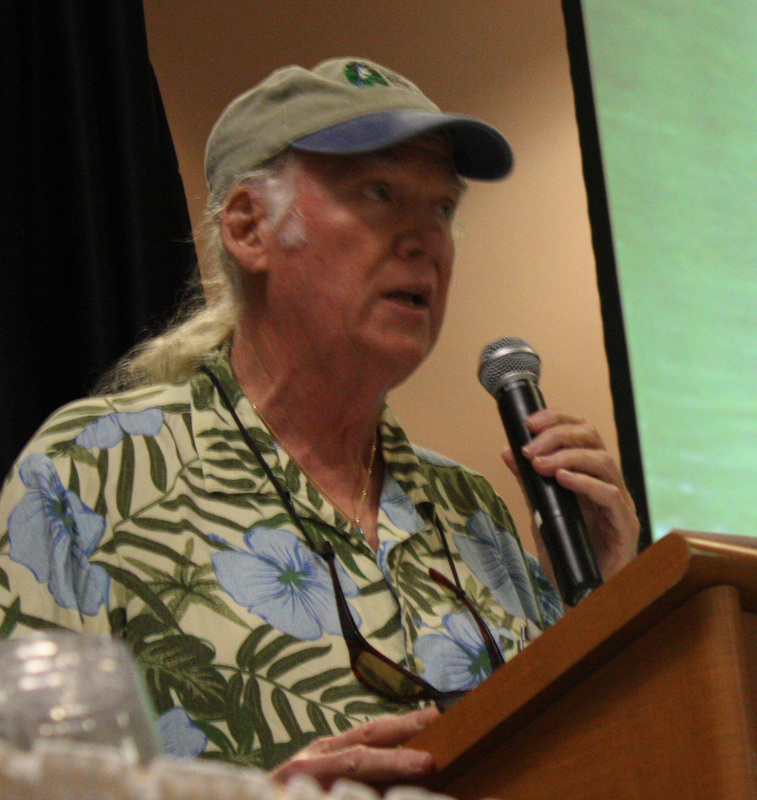 Clark laments that the springs seem to be in decline—some have even dried up—but most notably, he said, they are being fouled with a native, but invasive algae. Researchers have been scrambling to determine the causes, and candidates include agricultural and lawn fertilizer, declining “grazers” that feed on the algae, higher water temperatures, declining flow rates from drought and over-consumption—or a combination of all as well as yet-to-be-discovered causes. 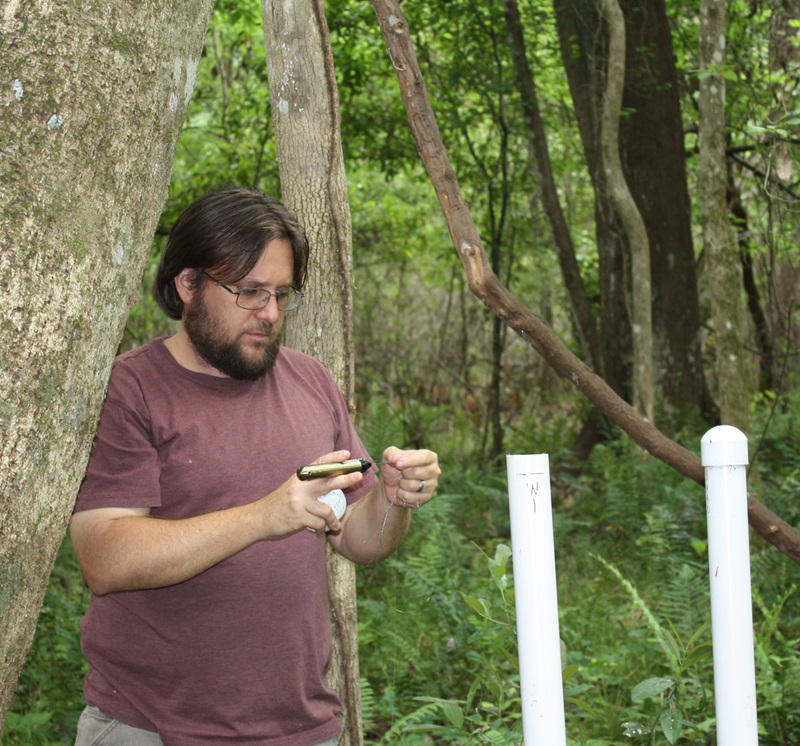 Clark is an ardent researcher, a skill that goes with the territory of his “day” job, so he has been able to ferret out details and facts about the status of Florida’s springs. He is alarmed by the challenges faced by these natural fountains of fresh water and that sees much to be done by the government, by industry, and by the people who use the springs. All the more reason, Clark insists, to get out and enjoy and the springs. 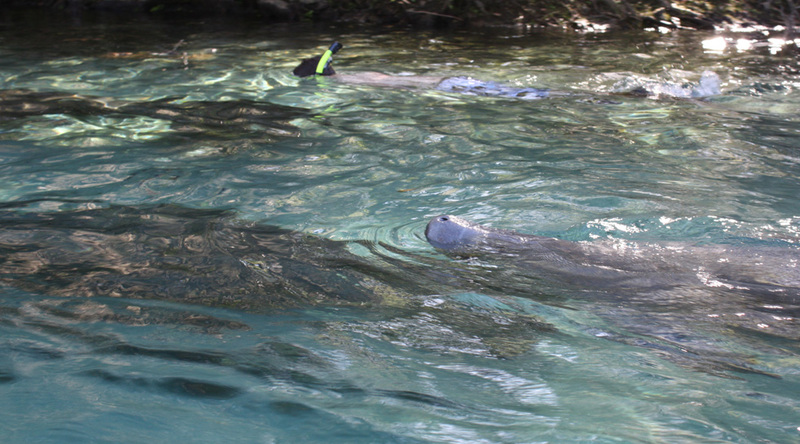 “We have to support the springs, participate in cleaning up and preserving these Florida treasures,” he said. 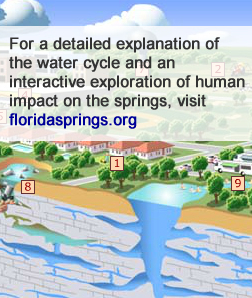 After all, he added, the “well-being of Florida citizens” is tied to these water sources as they actually spring forth from the huge underground reservoir called the Floridan Aquifer, the source of most of Florida’s potable water. 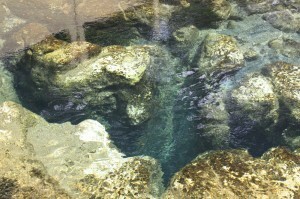 “Most people visit these well-known springs,” Clark said. He said he enjoys discovering the lesser known and smaller magnitude springs on his own or with his children. “I want to personally share with other families the best springs around,” Clark said. Clarity of the water is high on his lists and so is safety. Is there a lifeguard? He also considers accessibility to the water and amenities such as picnic areas, and concessions, clean bathrooms. 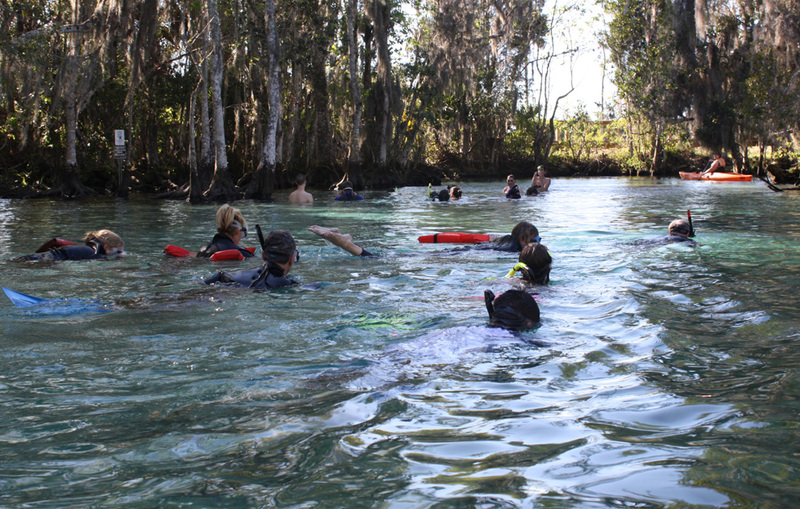 Recreational activities such as availability for tubing, snorkeling, kayaking or camping are also important. His favorite springs? Blue Springs is one of them. 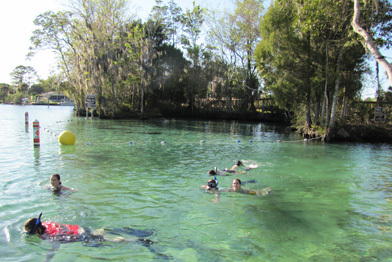 Another is Wakulla Springs, near Tallahassee where Clark lives much of his time, even though it is a long commute from his job Clay County. 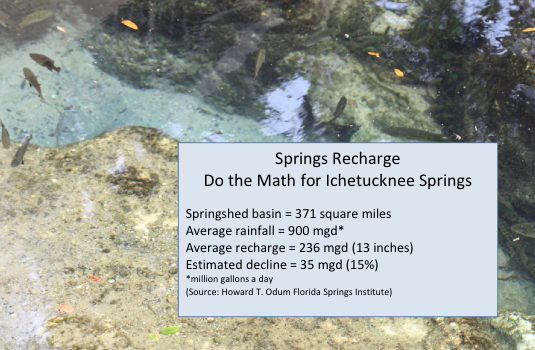 For a complete list of springs and Clark’s first-hand knowledge and in-depth research of the best spots, visit his blog where he also keeps readers up to date on the health of Florida springs both biologically and politically. Top Photo: One of the many shots Paul Clark has taken of springs in Florida.